Preface: highly theoretical. The fact that ACKS lets you conquer an empire within the limitations of 14 levels is one of the magical features of the system, and I wouldn't change it. But, we're all about pushing boundaries here at the C&B, so. I've been puttering around in the Dwimmermount book, looking at azoth and tying it to the 'viz' product in Blackmarsh. ACKS Dwimmermount contains two things that are interesting in this respect - a spell progression table for casters from levels 15-18, and a little note on pg 409 describing physical immortality - if you are physically immortal, your maximum level is increased to 18th. What's the ramifications of that, assuming you can survive the process and successfully achieve at least physical immortality? So there's clerics and mages; voted most likely to crave immortality in the adventurer school yearbook. I took raising the level limit to be the full level limit - not just the gaining of HD that happens when you're undead and above the 14th level limit - so proficiencies and the like are in play. What other values-by-level does ACKS contain? Let's start at the bottom of ACKS and work our way up. First, demographics. So, somewhere I've got it in my head that an "empire" is about a million square miles. Australia + Oceania is about 3 million square miles - call that a small continent. That leaves room for about three empires, or two empires and an empire's worth of innocent bystanding kingdoms and principalities for them to push around. Those population numbers could probably be pushed around a bit. 1 billion people is about the population of the globe in 1800, according to Wikipedia, at least. That planetary number - 850 million people - is 170 million families; at 300 families per hex, that's 566,666 6-mile hexes - or 17.5 million square miles. That's the size of Asia, more or less, and leaves somewhere in the ballpark of 40 million square miles of unsettled wilderness, if one is to assume Earth's total landmass size. Funnily enough, that's about a 1/3 civilized to 2/3 wilderness ratio - about 20 million square miles vs 40 million square miles. If you treat the planet as a "region" from ACKS pg 235, that's the same ratio of points of interest between settlements and dungeons/lairs/etc. Spooky ACKStion at a distance. What about income? A lot of the calculations, IIRC, are based off of however henchman wages are calculated, which has something to do with relative net worth, so let's start there. Then, XP thresholds seem to be just a hair above those wages, around the 110% mark or a bit less. You could exceed your GP Threshold for those higher levels, but it'll take work. Troop recruitment times are already listed for continental movements; it's in year increments. Hemispherical might go up to 2 years; planetary a half decade - dunno. Very theoretical at that point, and may rely largely on geography. Anyway. Largely a thought exercise. I'd offer higher levels to spellcasters who transform themselves, perhaps, in a Baleful Sky campaign. If you're the sort that can bring an entire globe under your heel, then you're the sort who can stand toe-to-toe with the horrors of the Outer Dark - this sort of metamorphosis is what's required to be an actor on a cosmic scale. Fighters, thieves, and the like - well, a natural death is the privilege of those who don't sell themselves to dark forces. Don't envy the mage; immortal power is it's own punishment. I'd appreciate chances to fix, clarify and/or improve, still somewhat a work in progress. Green is Yes/Success to a question or roll, red is No/Failure. Note I differ from Charles' presentation in that I assume if you are a thief you would still want to Move Silently against an inattentive target so that you can deny them their Hear Noise - every little bit helps. The difference in not doing so, perhaps, is movement speed - do you want to take your chance and get up to them right now, or take a slightly different chance and get to them in another round? Whether or not concealment is available should be irrelevant to an inattentive target - a Judge could allow the thief to be quite nervous about making her throws while knowing that failure doesn't matter. Operationally, then, what does this tell us? If no concealment is available, the attentive target gets their regular surprise chance. This is modified by character classes or proficiencies that give a player the ability to impose a penalty on opponent's surprise rolls - barbarians, for example, being Naturally Stealthy. If concealment is available, for the attentive target, these motions get us to the point where we can attack/interact within one action/round. 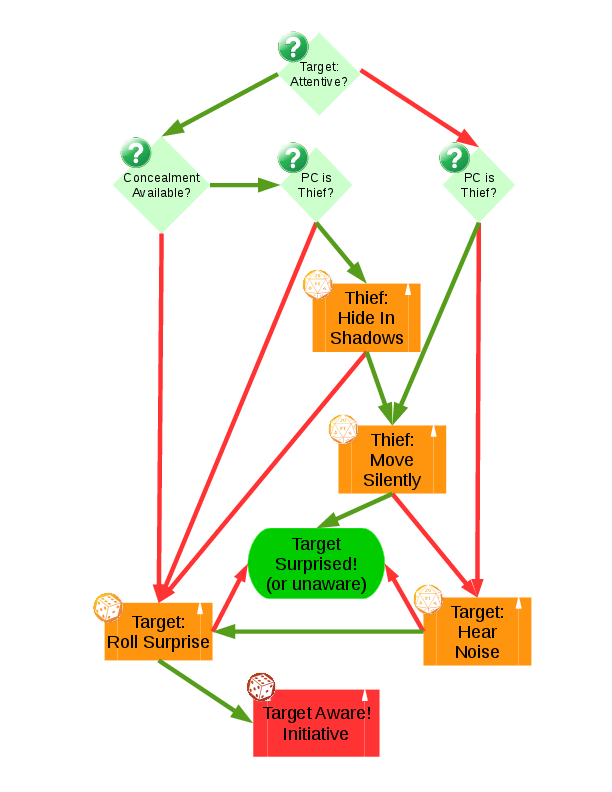 Again, the naturally stealthy folks get a general bonus, whereas a thief can take the extra options of the two sneaky skills to completely deny the target their surprise rolls. Any thief should take the opportunity to gain that proficiency if the Judge allows. The math is ever in their favor. If the target is inattentive, then it's a easier task. The thief may invoke a Move Silently roll to deny the target a hear noise to notice them coming. Everyone else either hopes the Hear Noise fails, or relies on regular surprise. Interestingly enough, while there's a proficiency/power that allows one to impose a surprise penalty to opponents, there isn't one for Hear Noise - there's no opposing proficiency to Alertness in part or in full. Hear Noise at it's default 18+ is so bad as to not really deserve further penalty. I've talked about that a bit here in regards to collapsing "sneaking" into a single roll. Inhibiting Hear Noise is purely the domain of the Move Silently skill, and Hide In Shadows is the only opposing mundane force to an attentive target, if concealment is available. Also, imposing a -1 surprise penalty is worth more (1 power) than a +1 bonus to one's own roll (usually a secondary benefit to a +1 initiative) (ACKS PC, pg 98). That's the value of surprise, offensively. A secondary note; Inaudibility (ACKS PC pg 137) can be recast as a very minor (4.41 points, I think) 1st level spell that lasts 1 round/level. If one treats the thief as permanently a 1st level caster, Move Silently is essentially casting that spell with a successful throw.